ERISA Help Center - How do I know how much is available for a loan? All Categories ​>​ Loans ​>​ How do I know how much is available for a loan? You can view the amount you have available for a loan by logging into your online account, clicking the Loans menu option – located under the Loans & Withdrawals menu section. 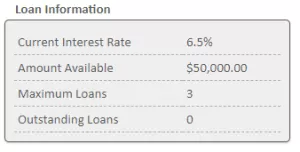 Once you’re on the loan page, click the Model/Request a Loan button and you will see your loan available amount on the right side of the next page in the grey “Loan Information box.